The driver of a tram which derailed in Croydon had probably dozed off moments before the fatal crash, an official report has found. 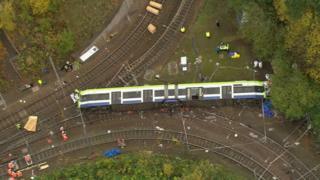 Seven people died and more than 50 were injured in the derailment in south London in November last year. The Rail Accident Investigation Branch also found action was not taken following a similar speeding incident just days before the tragedy. The 174-page report has made 15 recommendations to improve tram safety. These include the creation of a dedicated safety body for UK tramways, a better understanding of risk of trams and the introduction of stronger windows and doors on trams. Investigators say all the fatalities and many of the serious injuries were caused by passengers being thrown out of carriage windows. The tram was running from New Addington to Wimbledon via Croydon, and was on the approach to Sandilands tram stop soon after 06:00 on 9 November 2016. A previous report said although the speed limit approaching the junction was 12mph, the tram had been travelling at an estimated speed of 45mph. The report said the most likely cause for the driver not applying the brakes was "a temporary loss of awareness of the driving task during a period of low workload, which possibly caused him to micro-sleep". It adds: "It is also possible that when regaining awareness, the driver became confused about his location and direction of travel." Tests found no drugs or alcohol in the driver's system and no medical abnormalities were identified in him. Simon French, RAIB's chief inspector of rail accidents, added: "There is no direct evidence of the driver closing his eyes or being asleep." When interviewed as part of the investigation, the driver said he had "no recollection" and "couldn't explain what happened", according to Mr French. A criminal investigation is being led by the British Transport Police (BTP) who arrested the driver on suspicion of manslaughter. The 43-year-old man, from Beckenham, remains on bail, a BTP spokesman said. The RAIB report also found management were not aware of previous incidents involving late braking on the approach to Sandilands. Some of this was down to a "reluctance of some drivers to report their own mistakes", the report said. On 31 October a passenger raised concerns about a tram which went "too fast" round a bend near Sandilands. The driver of that tram applied the hazard brake, but the driver did not report the incident. The RAIB said on Thursday, that tram "came close to coming off the tracks." People were "ejected" from the carriage and some became trapped and crushed as the speeding tram ground to a halt, the report found. The RAIB is advising tram operators throughout the UK to make sure windows are fitted with stronger glass. London's Transport Commissioner Mike Brown said: "Since the incident we have introduced a wide range of additional safety measures to make sure such a tragedy can never happen again. "These include new signage and warning systems for drivers, additional speed restrictions, enhanced speed monitoring and an upgrade of the CCTV recording system. "An in-cab driver protection device has been trialled and is now fitted to every tram, meaning that any sign of driver distraction or fatigue results in the driver being alerted immediately. Work to install a system to automatically reduce tram speeds if required is also underway." The Croydon tram service is run on behalf of TfL by Tram Operations Limited, a subsidiary of FirstGroup. Tim O'Toole, FirstGroup's chief executive officer, extended his condolences to the victims and added: "The RAIB concluded that management of fatigue was not a factor in the incident, nor did a speeding culture contribute to it. "Nevertheless, over the past year we have taken a series of actions, working closely with TfL on whose behalf we operate the system, to implement additional measures including enhanced speed monitoring and restrictions, improved signage and renewed guidance on fatigue management." What is totally damning is how fundamentally broken the reporting and complaints process was at the tram operator run by First Group. Drivers were afraid to report for fear of recriminations and when passengers complained - such as after a speeding incident on 31 October just 10 days before the crash - the investigation was glacial. The families of those who died are heartbroken and outraged that opportunities to stop speeding incidents were missed. In fact, the complaints procedure has been deemed so broken, TfL has taken it away from FirstGroup and brought it back in house. Again this will raise huge questions about the fragmentation of the transport industry and I'm sure questions about the role of privatisation and companies operating concessions on behalf of public bodies. Despite the RAIB publishing its findings, there are still other separate investigations being carried out in parallel with each other. TfL has commissioned its own probe into the disaster, while the Office for Road and Rail (ORR) is looking at whether there were any health and safety breaches which contributed to the crash. In response to the report, London Mayor Sadiq Khan said: "This was a preventable accident, seven people lost their lives and they shouldn't have done so. It's really important we learn lessons." The driver's union ASLEF's Finn Brennan said tram drivers still have a "fear" of being sacked if they "report being tired or sick". He added "management culture" at Tram Operations Ltd meant mistakes were not listened to and acted on properly. Sarah Jones, MP for Croydon Central, said: "Our first thoughts will always be for the victims' families. "They will be reliving this tragedy yet again, and it will be another difficult day for them. The most important thing we can do for them is show that lessons have been learned and make sure this never happens again."